When Microsoft added support for the revamped Start page into Windows 8.1, that eliminated the need for dedicated third-party Start menus, right? Wrong, say developers like Stardock, Classic Shell, and others. Perhaps not surprisingly, the third-party devs say there's still a need for their products, even though Windows 8.1 will be more friendly to those used to the traditional, or legacy, Start menu found in Windows 7. Many have released updates for the Windows 8.1 preview, but none that spoke to PCWorld said that they've thrown in the towel. "Classic" Start menus provide an alternative to the Windows 8.1 Start button. These products fill a need: to ease the transition to Windows 8 and its unfamiliar Start page. In many ways, Windows 8 is just Windows 7 with a tablet interface layered on top of it, but—sorry!—no Start button. Users upset by the jarringly different Start page had no refuge from it other than third-party alternatives. "The start button shortcut to the start screen that Microsoft is providing with Windows 8.1 does not replace the start menu in the eyes of our growing customer base," Robert McElroy, the marketing and sales manager at Stardock Corp., said in an email. "Customers looking for the functionality of the classic start menu to help them navigate Windows 8 in a way that has been familiar to them for years will still find Start8 from Stardock enables that capability seamlessly." Microsoft, for its part, has said that Windows 8.1 represents a "heck of a lot of movement, a heck of a lot of innovation, and a heck of a lot of responsiveness, all coming to market in a very very rapid timeframe," in the words of Microsoft chief executive Steve Ballmer during the company's Build 2013 conference in June. 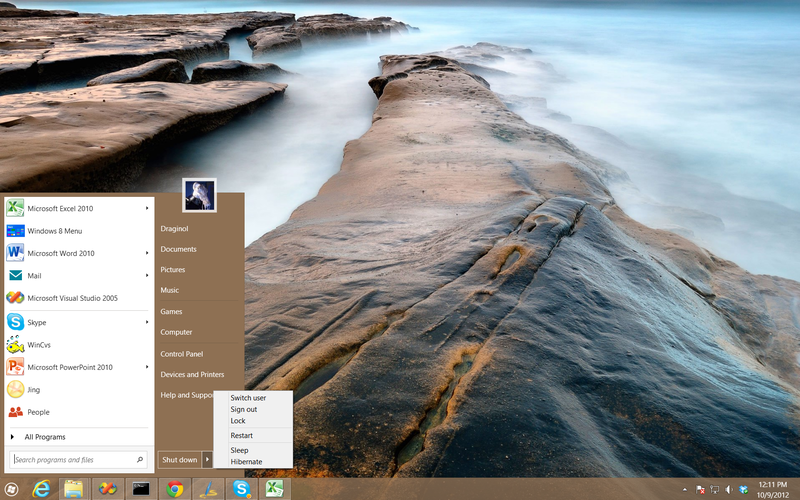 Some of the functionality that the third-party applications added for Windows 8 users, however, now overlaps with some of what Microsoft has added for the upcoming Windows 8.1. Start8, Classic Shell, and StartMenu8 all boot directly to the desktop, meaning that piece of the puzzle, at least, is duplicated by Microsoft. 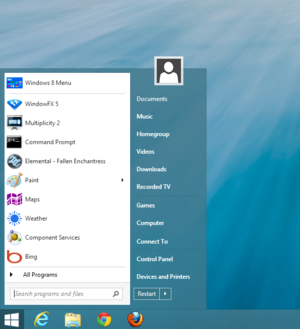 But all three also offer the traditional Start menu, with Classic Shell offering either a "classic" menu, or one in the style of either Windows XP or Windows 7. (Classic Shell's version 3.6.8, released in June and compatible with Windows 8.1, was asked to remove its version of the Windows flag, which it calls the "Metro button", at the behest of Microsoft.) For its part, Start8 also offers an option to shut down from the desktop, which is now in Windows 8.1 as well. 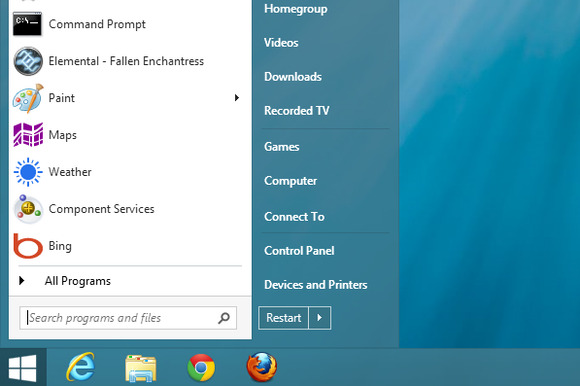 Stardock's Start8 offers shutdown options from the desktop. Nevertheless, the developer of Classic Shell said that his product was as viable as ever. "Nobody killed anything," he said, via an exchange though his Facebook page. "The only feature they added that Classic Shell (and others like it) has, is the immediate boot to Desktop." The question now is whether or not Microsoft's Windows 8.1 update, and the functionality it added, provides yet more opportunities for developers like Classic Shell to add features. They'll have some time; Microsoft has said that it will hand over Windows 8.1 to OEMs at the end of August, with a consumer update at some point thereafter. PCWorld asked the developers what their plans are, but the Start developers aren't talking. "Too early to tell. It is still a preview, not even a beta," the Classic Shell developer said. "Even without it I have my hands full at the moment."